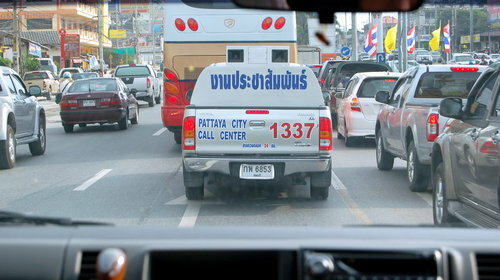 From our road trip to Pattaya a couple weeks ago. If you love frogs, you probably shouldn’t read the latter half of this post, but I’m not hiding it in the extended entry, either. Do or do not, there is no try, as it were. 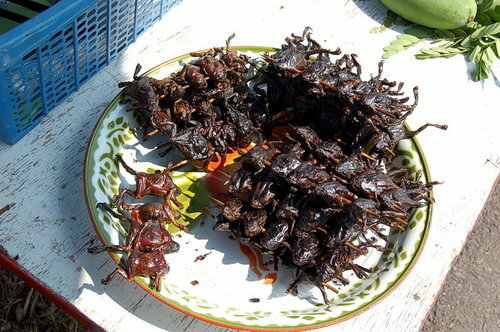 This post goes out to my brother Adam, who definitely might be man enough to eat skewered frogs after a few beers (although we did it sober here). The one I pulled apart in the tissue shown above was pregnant, so the blurry black and white dots are eggs. 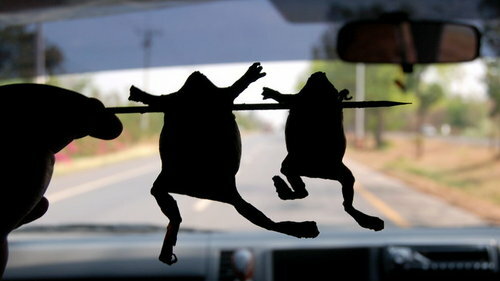 Actually, the pregnant frogs were more expensive than the non-preggers (30 Baht/stick vs. 20 Baht/stick). I’m going to preempt any “the trees are screaming” complaints at this time by pointing out that this is normal fare for hunters and gatherers, which many of the indigents here are. I will also go on record that these frogs do not taste like chicken. They do not taste too bad, though… That is, they don’t really taste of anything, really – it tastes like you are eating a rich, fatty protein, if that makes any sense. 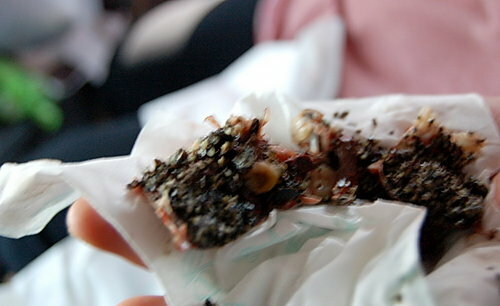 Maybe like a roasted shishamo, but not as delicious. I will admit that it took a bit of courage to eat one. After all, it was the same kind of frog I found in my shoe a while ago (called un-an in Thai). It’s so strange to think that people have been eating down the food web for most of our history, and it has only been relatively recently that people have had the luxury to eat larger animals. Though, the way we are going, it is a possibility that animals currently not considered food in the Western world will be re-evaluated with the hike in food costs. Frogs, though, probably won’t be very popular over here, simply because there are so few left, and the water upon which they depend, is not available to them. Not as good as shishamo, you say? I wouldn’t shy away, but why eat something that is only OK? 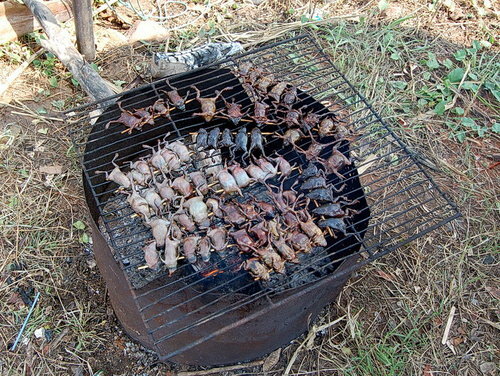 Maybe there’s another more delicious frog, or a better way to prepare them? Adam is right. No more frogs in places where just a couple of years ago, you’d hear the incessant nocturnal croaking. I stayed up in Sebastopol last month and it was eerily quiet. When the wineries came in and bought up all the farmland, they used a lot of toxic pesticide and fungicide and now, no frogs, period. But you can buy 2 Buck Chuck, if cheap wine is your level of taste. 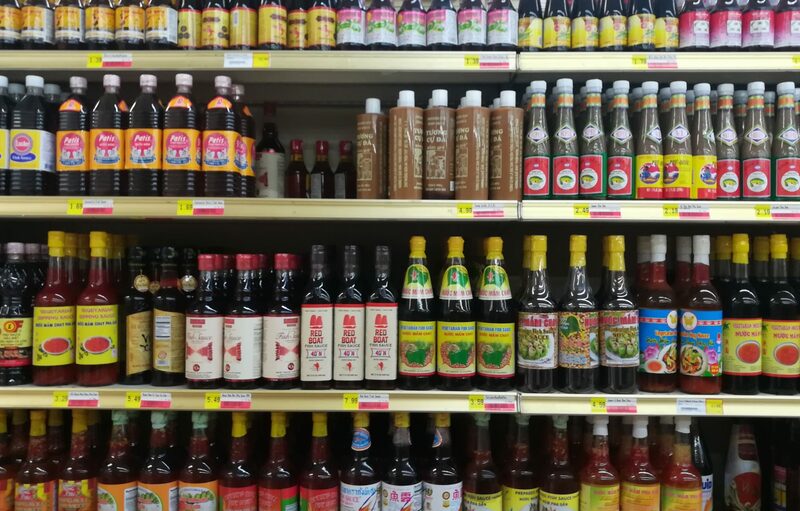 Culinary thought: I wonder if marinating frogs for 24 hours might improve the taste of the mild, not-delicious frog meat? 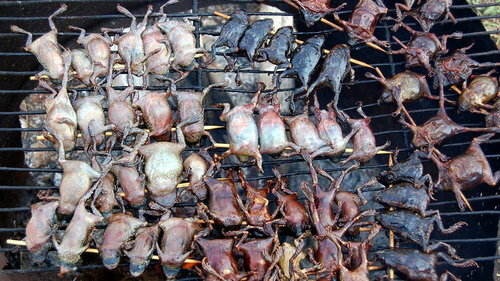 I have to tell you, just looking at those rows of skewered frogs makes me feel nauseous.